Every civilization has its own unique cuisine and cooking styles, and so is the Indian civilization. Indian cookery was significantly influenced by Ayurveda, its indigenous healthcare system that emphasizes dietary regimen for both the healthy and the ill. Ayurveda prescribes many daily food items as drugs in various medicinal formulations. Thus, Indian cooking is known for its medicinal properties. There are various dietary preparations (patthya kalpanās) explained in Ayurveda with specific indications of diseases and treatment methods. On the other side, there are various classic books written exclusively on cookery like Bhojana kutūhalam by Raghunātha Pandita, kṣemakutūhala by Kṣemaśarman, Pākacandrika by Annaji Ballala Bapata Indurakara Vaidya and Śiva tattva ratnākara. 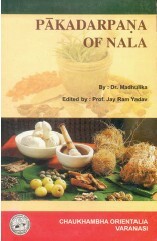 Pāka darpaṇam is one such Indian text on traditional cooking written by King Nala of Niṣidha kingdom. Pāka literally means cooking or cooked food and darpaṇa means mirror. Thus title indicates that the work reflects the cooking methodologies. King Nala, husband of queen Damayantī was a well-known cook in Indian epics, so much so that any delectable preparation of food is still eponymously termed to be nala pāka. However, there is not clear time period ascribed to him. He mentions himself as the author at the end (upa-saṁhara) of each chapter. Meulenbeld mentions in his book that the earliest author to refer the work on cookery by Nala is Cakrapāṇidatta. Some names of plants may point to a period not earlier than about 1200 AD. Since red pepper (Capsicum annuam) is absent from the Pāka darpaṇam, it dates probably before introduction of this type of pepper into India in the 17 th century AD. The book is written in Sanskrit and its original edition was edited by Pt. Vāmacarana Bhattācarya. This book was translated into Hindi by Dr. Indradev Tripati, and is published by Chowkambha Sanskrit Sansthan, Varanasi, and the English translation is done by Dr. Madhulika and is published by Chowkambha Orienalia, Varanasi. The text is comprises of 11 chapters, having 751 verses (as in Dr. Indradev Tripati's Hindi translation version; and 760 as per Meulenbeld). Interestingly, the very first chapter contains 499 verses, i.e. about two thirds of the entire text. Eighth and eleventh chapters are the smallest ones having nine verses each. The verses have been composed as a dialogue between King Ṛtuparṇa and King Nala. The King Nala renames himself as Bāhuka after having lost his kingdom and worked as a cook under King Ṛtuparṇa. The first chapter is titled as granthopakrama deals with the qualities of ideal cook and waiter (pariveṣaka) and elaborately explains different origin. It lists a total both vegetarian and nonvegetarian food preparations of of 16 kinds of dishes viz. odana (cooked rice), sūpa (preparation of de-husked legumes), sarpis (ghee), vyañjaka (side dish), māṁsa (meat) and śāka (vegetables), bhakṣya (munchable eatable), pāyasa (milk pudding), rasāyana (rejuvenative), pāna (drinks), yūṣa (preparation popularly known as khichḍi), different rice preparations such as curd rice, ghee rice etc., lehya (lickables), pānīya (water), kṣīra (milk) and takra (butter milk). The chapter claims that anna (cooked rice) has 63 tastes and eight defects. The author has enumerated only eight defects and but not the tastes. The eight defects of cooked rice are asṛtānnna (rice preparation using rice whose qualities go against the season), paicchilyānna (over cooked, sticky rice), kwathitānna (only little quantity of rice taken for cooking and boiled), śuṣkānna (dried cooked rice), dagdhānna (burnt rice), virūpānna (cooking rice without proper size and shape), and anaṛtujānna (rice against the season or stale cooked rice). Further the author explains the method of cooking of rice. Rice which is unpounded, dry and older should be taken and should be washed in hot water. A vessel should be taken and should be added with three parts of water. The vessel should be placed on fire. When water slightly boils up, the washed rice should be put in the vessel. When rice starts boiling, it should be stirred using a spoon repeatedly. At the same time, milk, butter milk or water should be sprinkled. Then the vessel should be taken out from fire for some time and again kept for boiling till it is cooked and smooth. This rice is good for longevity and health. In the same chapter, the author explains the method of preparation of nonvegetarian biriyani. For this, three parts of water and one part of rice should be taken and should boiled. When the rice begins boiling, boiled or unboiled meat that are cut into small pieces to the size of rice, should be added along with little rock salt. It should be mixed well and little quantity of ghee should be added. When water is dried up, it should be taken out of the fire. The preparation is seasoned with coconut-milk and freshly prepared ghee along with attractive flowers of ketakī (Pandanus fascicularis). Pieces of parpaṭa are added and the preparation is given its unique fragrance using camphor and musk etc. Later the vessel should be closed with the upper lid and it should be kept on fire and mixed well. When the dish becomes soft, it should be served for eating. This maṁsodana (meat biriani) is tasty, aphrodiasic, wholesome, light for digestion. It gives strength to the body and nourishes all the tissues and heals wounds. Specific nonvegetarian rice preparations include mudga taṇdula maṁsānna (green gram rice biriani), lāvaka maṁsodana (sparrow meat biriyani), and kukkuṭa maṁsodana (chicken biriani) etc. Continuing with these meat preparations, the author has introduced the concept of gara viṣa or saṁsargaja viṣa (artificial poison/combinatorial poison). Anything which is healthy and safe can become toxic on wrong combinations. For example, a combination of sesame oil and camphor is poisonous, but as individual drugs both are safe themselves. This kind of combinatorial poison is called gara viṣa. The same combination along with meat and cooked rice become nontoxic. Even poisons become nectar or therapeutic agents when used in a proper quantity. On the other hand, even nectarine drugs if used in improper quantity could become a poison. The method of sūpa (dehusked legumes cooked) preparation has been explained. Horse gram (Dolichos biflorus), black gram (Vigna mungo), cow peas (Vigna unguiculata), and chickpea (Cicer arietinum) etc., which are cleaned of physical impurities using grain sieve (śūrpa), or de-husked green gram (Vigna radiata) should be taken in one part, and equal quantity of water has to be mixed and boiled. When legume is well prepared, suitable quantity of rock salt has to be added. Turmeric is used for colouring and asafoetida is used for its aroma. This has to be churned thoroughly using a spoon adding water. Later, this mixture is seasoned with camphor, and various aromatic flowers. This dal preparation appetizing, subsides pitta and lighter for digestion. Different kinds of butter milk preparations have been dealt with. A few interesting combinations include butter milk being mixed with certain drugs like ajamoda (Carum roxburgianum), trikaṭu (equal combination of fruit powder of Terminalia chebula, Terminalia bellirica, and Phyllanthus emblica) and other drugs with good fragrances. The book also deals with preparation of butter. The milk that is boiled and reduced to half should be taken, and curd should be prepared out it. The curd so got is to be churned well to get butter. This butter should be washed 10 times with water. Butter thus obtained should be filtered in cloth having fine holes. And again washed and treated with flowers having good fragrance and stored in a vessel containing water. This butter is aphrodisiac, cosmetic, energizer and it increases power of sense organs. The book deals with preparation of ghee. Whitish butter should be washed in water till it attains yellowish color. It should be melted in mild fire and be filtered. Again the heated butter so obtained is melted till the frothing stops and the melted butter turns into reddish color. Attractive flowers and a little wheat flour should be added. Camphor and black Piper betle (tāmbūla) leaves dipped butter milk may also be added. Various vegetable foods prepared using different parts of the plants have been explained in the book. This includes preparations made using banana (Musa paradisiaca) fruit, body of banana tree (raṁbhā sthaṁbhā), brinjal (Solanum melongena), jack fruit (Artocarpus heterophyllus), cow pea (Vigna unguiculata), Elephant foot (Amorphophallus campanulatus), radish (Raphanus sativus), Basella (Basella cordifera), caṇakapatra (leaf of chick pea Cicer arietinum), tikta pṭola phala (fruit of Trichosantbes dioica), jīvantī śakhā (the herb Caelogyne ovalis), fruit and leaves of kāravallaka (Momordica charantia), and leaves of punarnava (Boerhavia diffusa), kumarī (aloe vera), bimbī (Coccinia grandis), guḍūcī patra (Tinospora cordifolia), arka (Calotropis gigantea), vaṭa (Ficus benghalensis), dhattura (Datura metal), padma (Nelumbo nucifera), kiṁśuka (Butea monosperma), vanaśigru (Moringa oleifera), palāṇdu (Allium cepa) and vāsā (Adhatoda vasika) etc. The second chapter, titled as Ṛtu dharma nirūpaṇam contains 42 verses and deals with foods that are wholesome in a given season. The author claims that there are changes of seasons even within a day and night. If time between sun rise and sun set is divided into six parts, the day's first part is the vasanta season; the second, grīṣma; the third, varṣa; the fourth, śarat; the fifth hemanta; and the sixth śiśira. Later, tastes of food to be taken in each season have been mentioned. In vasanta season, pungent, sweet and salt; in grīṣma, sweet, sour and salty; in varshā, pungent and bitter; in sharat, sweet and bitter; in hemanta, sweet, pungent, bitter and astringent; and in śiśira, bitter or sweet tasting foods should be consumed. In this chapter, suitable meats have been separately specified for each season, such as hariṇa (deer) and eṇ in Vasanta; meśa (goat) and āvika (sheep) in grīṣma; kukkuṭa (chicken) and sea fish in varṣa; river fish in sharat; pig and rabbit (śaśa) in hemanta; caṭaka (sparrow) and lāvaka (sparrow) in śiśira. It is to be noted that specific vegetarian food is not mentioned according to season while nonvegetarian food prescription is specific. The third chapter, vibhinna bhakṣya padārthānām nirmāṇa prakāra nirūpaṇam, contains 19 verses. Two different eatables (bhakṣya) made using wheat, coconut, niṣpāva, milk and fragrant flowers etc.have been mentioned. The term bhakṣya means that these are to be munched (eaten after mastication). The fourth chapter Pāyasa prakāra nirūpaṇam contains 33 verses, deals exclusively on milk pudding (pāyasa). Pāyasas like garlic payasa, and wheat payasa are described. In the fifth chapter, Pānaka bheda nirūpaṇam, with 25 verses deals with different drinks (pānaka). Swarṇapātra (golden vessel) and certain gems are precsribed to be used for the preparation of drinks. Different fruits of which pānaka preparations have been mentioned are mango (Mangifera indica), lemon (Citrus lemon), parūṣaka (Grewia subinaequalis), tamarind (Tamarindus indica), jaṁbū (Eugenia jambolana), banana (Musa paradisiaca), and flowers of karavīra (Nerium odorum), bakula (Mimusops elengi), tamarind, and punnāga (Calopbyllum inophyllum) etc. The sixth chapter of 27 verses is titled as Vividha anna yūṣa pāka prakaraṇam in which method of preparation of various dishes of rice popularly known as khichaḍi. However, yūṣa in the text is indicated for sticky consistency and is rice dominant product, added with certain other food items like curd, and certain fruits like lemon, kumbhī phala (Careya arborea) and different flowers. The seventh chapter is named as Ghṛtānna pāka prakaraṇam, having 26 verses and it deals with rice preparations processed with ghee or curd or other juices like cincā phala rasa (juice of tamarind) or some pastes like kaitarya (Murraya koenigii) kalka, sarṣapa (mustard, Brassica campestris) kalka etc., Two preparations ghee rice and curd rice which are commonly prepared nowadays are almost same as explained in the text. The eighth chapter, Lehya prakaraṇam with 9 verses, deals with preparation of the sauce like dishes using fruits like mango, etc. Fruits like mango etc. with their seeds removed are to be taken separately, mixed and heated with sugar, and when semi-solid, a little quantity of water should be added. Later it should be filtered through clean cloth having minute holes. All lehyas such as the one prepared out of mango have been prescribed to be seasoned with flowers having good fragrance. The ninth chapter is titled as śaitya jala nirmāṇa prakaraṇam having 49 verses deals with water cooling techniques. For cooling of water, various methods are mentioned like exposing the water to open air and passing through sand, fragrant flowers, adding certain drugs of cold potency such as like kataka (Strychnos potatorum) etc. The tenth chapter is named as Kṣīrādi Pāka Nirūpaṇam having 22 verses and it deals with milk preparations. There are two types of milk preparations explained, buffalo milk is advised to be taken in both contexts. In the first method, equal quantity of milk and water should be taken in small vessels and boiled till complete evaporation of water. A suitable quantity of sugar is to be added and served. In another method, without adding any water, milk should be boiled and reduced to half or one-sixth or quarter and it seasoned with fragrant flowers. The eleventh chapter consisting 9 verses is termed as Dadhibheda prakaraṇam and deals with traditional method of preparation of curd. Though the word, bheda denotes types, only one method has been explained in this chapter. The text gives a classical reference to the majority of Indian traditional dishes, prepared even now. Based on the consistency of prepared food, and the mode of intake, the author has divided all food into five categories namely, bhakṣya (munchable, i.e. what may be eaten after mastication), bhojya (what may be eaten without mastication), cośya (suckables), lehya (lickables), and peya (drinkables). The preparations include both vegetarian and nonvegetarian food stuffs. It deals with preparation modes starting with cooling water to preparation of milk, butter milk, curd, butter, ghee, different vegetables including leaves, tubers, fruits etc., and meat of animals, fish and birds. Some of the leaves that are not used or rarely used as eatable vegetables nowadays were also part of preparations like Dhattura patra śāka etc. The book also suggests that the food habits of this region were rice centric this is because the author lays special emphasis on preparation of rice and lists eight defects of cooked rice. The author quotes "sarveṣām prāṇinam prāṇam annam prathamamuccate." Which means: Food is the very life of all animals. Though the word anna refers to food, the context in which it has been said, it refers to cooked rice, since defects of cooked rice and method of cooking rice are explained along with this. Certainly, it is an interesting book for one who wishes to know more about Indian cooking and who wants to discover such dishes on the classical guidelines.